Early on the morning of Monday 9 May 2016, the day of the Transit of Mercury, things were not looking good. Nick Phillips and I were exchanging emails after consulting the various weather forecasts for the day. They all said the same thing… cloud… lots of it… followed by rain. So, should we go ahead with our event at the Royal Observatory Greenwich or not? An easy call if it’s just the two of us involved, but we had 15 other Flamsteed volunteers to worry about, and didn’t want people to have a wasted journey. In the end, we decided to go ahead “more in hope than expectation”, but gave our volunteers the opportunity to stand down as “due to the expected weather, we feel that the day will not be as busy as we first hoped”. How wrong we turned out to be (along with all the weather forecasters)! In the end, the skies were gloriously clear for the first two hours of the transit. After a spell of cloud cover, we then got another 30-45 minutes of viewing. 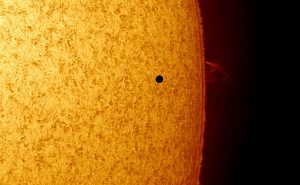 During that time, nearly 600 people viewed the transit through the 5 solar telescopes that we had set up. A fantastic effort by all of our volunteers. At precisely 12:12:23 BST, as predicted, we saw the first glimpse of the planet Mercury as it passed in front of the eastern limb of the Sun. Through the hydrogen-alpha telescopes, it was an even bigger thrill, as the planet passed in front of a huge prominence (the prominence that you can see on the right-hand side of Rupert’s image above). Mercury looked like a tiny black dot on the surface of the Sun… but any fears that it would be too small for people to see were soon dispelled. Though it was small, it was completely black, providing a very high contrast object for people to see. Its perfectly round shape meant that it couldn’t be mistaken for any other solar feature, such as a sunspot. The BBC Horizon crew were in attendance, along with a Sky News team, which resulted in great publicity for the society and the ROG. However, it’s the reactions of the public that make it all worthwhile… the publicity is secondary. We had some fantastic responses from people who attended… people love seeing these big astronomical events. Viewing the transit of Venus in 2004 and 2012 was very special… but, despite it’s tiny size in relation to Venus, the transit of Mercury provided similar responses from people who witnessed it. 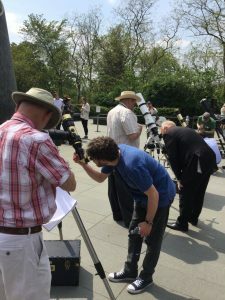 We always get a few “wow’s” at our regular solar viewing events… but, on this occasion, virtually every single person went “wow” when viewing the transit! 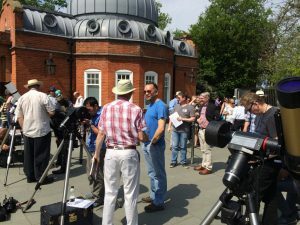 The Royal Observatory had made a special solar filter for the Great Equatorial Telescope, and were using it to observe the Mercury transit, and provide a live YouTube feed, which was being watched by thousands of people. It was fantastic to see this historic telescope being used in this way. Sumitra has produced a fun time-lapse video of the event, along with some of the resultant publicity for the ROG and the Flamsteed. Link to the video is here. After I got home, the heavens opened, so I suppose the forecasters got that right, but they were at least a couple of hours late! Lucky for us that they were, and even luckier that we didn’t listen to them! It’s still sunny! Mercury Transit is looking great. The event wouldn’t have been possible without our fantastic team of volunteers. Thanks to all those who participated on the day: Andy Sawers, Barry Cassels, Ben Pretorius, Bill O’Brien, Clive Inglis, Grey Lipley, Jane Bendall, John Williams, Mark Duwe, Mike Meynell, Nick Phillips, Paul Perrin, Roger Geeson, Rupert Smith, Stan Payne, Sumitra Sri Bhashyam and Tim Newling. Thanks also to those who had intended to be at the event, but, for one reason or another, couldn’t make it along. Circumstances mean that it’s not always possible for people to volunteer, but we do appreciate your efforts nonetheless. We have a long season of solar viewing in front of us, so we hope that many of our volunteers will be able to help us through this busy summer programme. If you have any other images from the event, please send them in, and we will add them to this report. The Great Equatorial Telescope is also being used to view #mercurytransit . Still sunny!